Last I checked, this anime seemed to be unavailable, but you could check again at the online stores to be sure. The above info came from NamonakiRei, and was edited by yours truly (contact me). The image came from animerate. A man runs away from explosions in an industrial complex. He carries a little girl, and they are followed by a pink cat. The man is struck by a piece of concrete. He starts to bleed. Leaving his daughter and the walking cat on an escape capsule, he tells to her, "Live!". And the capsule goes out to space. Luna wakes up from a dream, about of when her dad died. She figures out that she's late for her first day on the new academy and he says good bye to Chako, the pink robot-cat, and goes running to her new school. There, she knows the loner Kaoru, the prideful Menori, the shy Sharla, the spoiled rich boy Howard, the obedient Bell, and the mechanical genius, Shingo. With them, she's going on a journey, a field trip, to know about terraforming. It's the 22nd century, an age of great space development, and the humans have been living in colonies for years, since the earth, overwhelmed by pollution, had such a change on the weather that it was not suitable for human life. So, humans had to move to space colonys, and terraform planets to live on. But, on this field, there will be an accident that will change their lifes. 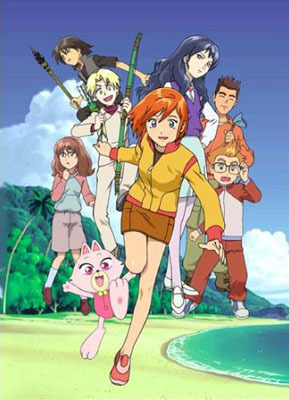 They seven people, and Chako, the robot-pet (who came in Luna's luggage) found themselves suddenly in the middle of a gravity storm, and fell on an unknown planet, much like former earth. There, their struggle for survival started. As time went on, they started to grow like a family, trying to uncover the mysteries of the planet, and to get safely back to their home. Will they make it? The above description came from NamonakiRei, and was edited by yours truly (contact me).